Webmotions provides a range of Content Managed solutions for sites of any size. A CMS (Content Management System) is a platform which allows a site owner to manage their own site content via an easy to use Web Interface. This elimates the need to hire a developer or techinical person to update your site. CMS platforms are database driven, which means all your site data is stored in a local database. The interface then allows you to add/edit/modify this data in a friendly fashion. Benefits of this kind of system is 24/7 access to your data, which means you can update your site at any time and from anywhere, providing you have internet access. The downside is your inital outlay will be higher due to increased time spent on creating your solution. How often does content on my site need to be updated? Do we have a technical resouce that can maintain a static implementation? Am i comfortable with managing my own site, knowing changes are immediate? Do i have sufficent server space? Am i prepared to backup my site or pay to have it backed up on a regular basis? We understand that making the decision to purchase a CMS or answering these questions can be difficult, but rest assured, our trained professionals will adivse the best solution for you and recommend what is truely benefical to your business. Contact us today for an obligation free discussion about a Content Management Solution for your business! Over the years, Webmotions has developed and utilized a range of CMS solutions. No matter what you are looking for, we can provide a suitable solution to match your business requirements. 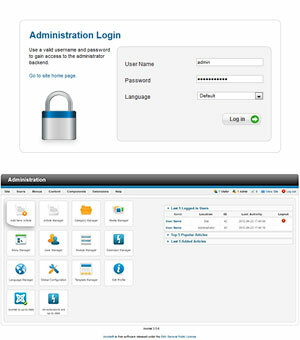 Many popular CMS solutions also include a wide range of free and commercial extensions. These range from image galleries to form builders to complex eNewsletter systems. Even if you can't find what your looking for, we can develop custom extensions or systems to fulfill your needs. for an obligation free quote! Webmotions is a Web Design and Development Company located on the Gold Coast, Australia. We specialize in Web Design, Custom Development, eCommerce Application, Content Management and much more. Copyright © 2012 Webmotions Pty Ltd. All rights reserved.